There are really many exciting features in Internet Explorer 8(You can read the post “Internet Explorer Beta 2 (IE8 beta 2) With InPrivate Browsing, Smart Screen Filter, Domain Highlighting, Accelerators and WebSlices” for more info). Accelerator is one of the new feature which will help you to get quick access to other web services. You can use Accelerators to search, e-mail, map, translate or share content from the web page you are currently browsing with just one click. 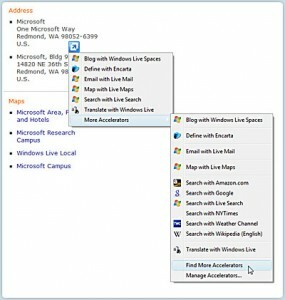 Accelerator in IE8 will be of great help when you are tired of cut and paste job from one website to another. Accelerators give you ready access to numerous online services you use everyday. All you have to do is just select some text and then click on the blue Accelerators icon and access the service. For example, you may be interested in the location of a business featured on a webpage. Earlier we used to copy the address from the current webpage, navigate to another the webpage for a mapping service, and paste the address there to get the information. 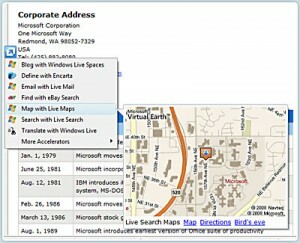 But now with the “Map with Live Maps” Accelerator for Internet Explorer 8, you can get an in-place view of a map displayed directly on the same webpage. Internet Explorer 8 Beta has got many useful Accelerators which includes mapping, search, dictionaries, translation, blogging, e-mail, shopping, Social Bookmarking and many more. You will have full control over which Accelerators are enabled and which service providers are associated with an Accelerator, so you can easily get definitions from one site, view maps from a second site, and search with a third. There are Accelerators for Facebook, Yahoo!, eBay, Wikipedia, Amazon, Google Maps, Wikipedia, YouTube and many more. The Accelerators gallery has got many Accelerators for many sites. You can easily delete, disable or enable an Accelerator from Manage Add-ons section. I hope we will see much more features from IE team to give a good competition to other Browsers. Thank you for the information about IE 8. The fact is, the capacity for a machine tool to translate context to the limited and still needs post-editing by human translators. If you have a need for highly accurate document translation and interpretations, you can use a professional translation service.